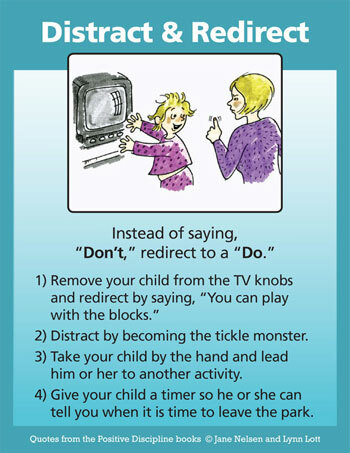 Children under the age of three do not understand “no” in the way most parents think they do. (And a full understanding of “no” doesn’t occur magically when the child turns three. It is a developmental process.) “No” is an abstract concept that is in direct opposition to the developmental need of young children to explore their world and to develop their sense of autonomy and initiative. Oh, your child may “know” you don’t want her to do something. She may even know she will get an angry reaction from you if she does it. However, she cannot understand why in the way an adult thinks she can. Why else would a child look at you before doing what she “knows” she shouldn’t do, grin, and do it anyway? Knowing things as a toddler means something far different than knowing things as an adult. Her version of knowing lacks the internal controls necessary to halt her roving fingers. Researchers like Jean Piaget discovered long ago that toddlers lack the ability to understand cause and effect (an excellent reason not to try to lecture and argue a toddler into doing what you want—or to use punitive time-out). In fact, "higher order" thinking like understanding consequences and ethics may not develop until children are as old as ten. The following Piaget demonstration illustrate intellectual development, and helps parents understand why children can’t understand some concepts (such as “no”) as soon as adults think they can. Find two glasses that are the same size. Then find one glass that is taller and thinner, and one glass that is shorter and fatter. Fill the two glasses that are the same size with water until a three-year-old agrees they are the same. Then, right in front of her, pour the water from one of these glasses into the short, fat glass, and the other one into the tall, thin glass. Then ask her if they are still the same. She will say, “No,” and will tell you which glass she thinks contains the most water. A six-year-old will tell you they contain the same amount and can tell you why. This demonstration illustrates the thinking abilities identified by Piaget. When we understand that perceiving, interpreting, and comprehending an event are so markedly different for young children, our expectations as adults alter. The meaning children attach to their experiences does not match the meaning adults attach to the same experiences. These stages of development do not mean children should be allowed to do anything they want. It does explain why all methods to gain cooperation should be kind and firm at the same time instead of controlling and/or punitive. This is a time of life when your child’s personality is being formed, and you want your child to make decisions about him or herself that say, “I am capable. I can try, make mistakes, and learn. I am loved. I am a good person.” If you are tempted to help your child learn by guilt, shame, or punishment, you will be creating discouraging beliefs (a sense of guilt and shame) that are difficult to reverse in adulthood. The three most important discipline tools to use with children under the age of four is supervision, distraction, and redirection. Showing them what to do instead of what not to do (showing them how to touch nicely instead of saying, “Don’t hit.” During the first years of life, your job is to keep your child safe without letting your fears discourage her. For this reason, supervision is an important parenting tool, along with kindness and firmness while redirecting or teaching your child. Parents almost always cite the danger of a child running into the street as a justification for spanking a toddler. Reasons include the life and death nature of the situation, the need for immediate compliance, and the effectiveness of a spanking for getting a child’s attention. The thing they forget is that to a toddler, an angry, shouting, spanking parent is probably far more frightening than any street. They know, spanking or no spanking, that they can’t expect her to have the maturity and judgment to have that responsibility. Distraction and redirection works well with toddlers. Fifteen-month-old Daniel was toddling toward his Dad’s computer. Dad called his name and Daniel looked at him, grinned, and toddled so fast in the direction of the computer that he almost fell. Dad picked him up, gave him a big hug, and took him over to his blocks. What if Daniel keeps returning to the forbidden computer? How many times must a parent distract or redirect a child’s attention? Well, as many times as it takes. As we’ve mentioned before, it takes patience and perseverance to train a young child. If Daniel’s dad slapped his hand or spanked him, would he still want to play with the computer? Probably so. And even if spankings stop the behavior, what is the cost in self-esteem, doubt and shame? What are the lessons about violence? Kindly but firmly directing Daniel toward acceptable objects, and continuing to do so until he gets the message, guides his behavior without punishing or shaming, and without inviting a battle of wills. Toddlers are experiencing individuation, learning to see themselves as separate, independent beings. It’s a natural and healthy process, but one that is frequently trying for parents. At one level it doesn’t take long for a young child to learn the power of the word “no,” or that by using it he can provoke all sorts of interesting reactions. Adults can’t always avoid these confrontations, but changing your own behavior and expectations can lessen their impact. Are you trying to gain control over children or with children? Trying to gain control over children is hard. It takes constant effort. You have to be very vigilant to police the action of children so you can implement your control tactics—usually punishment and rewards. You have to catch children being “good” so you can reward them and catch them being “bad” so you can mete out the punishment. It never ends—and what happens when you are not around? If you are very good at being in control over children what have they learned? Have they learned self-discipline, respect for self and others, responsibility, problem-solving skills, cooperation? Trying to gain control over children is disrespectful and greatly decreases your chances of winning cooperation. Disrespectful methods invite distance and hostility, rebellion, revenge, sneakiness to avoid getting caught, or, worst of all, a child’s developing belief that, “I am a bad person.” On the other hand, respectful methods invite closeness, trust, and cooperation. Rudolf Dreikurs taught the importance of “winning children over”, instead of “winning over children.” One of my favorite terms is “connection before correction.” The best way to make a connection and win children over is to be respectful. 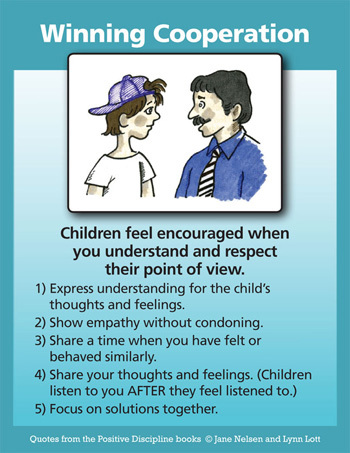 One of the best ways to be respectful is to “get into the child’s world” and express understanding of the child’s feelings. Showing empathy is not the same as condoning. A really nice touch is sharing a time when you might have felt the same. These are the steps to create the connection to increase the chances that you can work for correction because children are likely to listen to you AFTER they feel listened to. In can be so difficult for parents and teachers to think they are not doing their job if they don’t engage in a lecture or some kind of consequence (usually a poorly disguised punishment). This will take you right back to the consequences (resistance and/or rebellion) you will experience by trying to gain control over instead of with your children. What do children learn when they are respectfully involved in finding a solution that works for everyone? Thinking skills, problem-solving skills, respect for self-and others, self-discipline, responsibility, listing skills, motivation for following the solution they have helped create. The list could go on and on. And, what better way to achieve control with, and to win cooperation. Once you have achieved a connection you have created an atmosphere where you can focus on a solution together. You have won cooperation. Mrs. Henderson told her son, Jon, for the third time that evening, “You had better do your homework before it gets too late. Jon shouted back, “Fine,” as he stomped off to his room and slammed the door. What creates a scene like this? Was Mom modeling respect as she shouted at her son to be respectful? No. Was Jon being disrespectful to his mother? Yes. Was Mom being disrespectful to Jon? Yes. Let me count the ways. She took control and gave orders (no matter how pleasantly). She robbed Jon of learning responsibility by taking over the responsibility of his homework. She didn’t invite Jon to figure out what he wanted and how to get it. She is not willing to allow him to experience the consequences of his choices—and to learn from them. Why is it that parents think it is their job to see that homework gets done? Oh, I can hear your objections already: “We can’t just let him fail.” Of course parents don’t want their children to fail. All the more reason to teach children self-discipline, self-control, goal setting, and problem-solving skills instead of trying to control them. All the more reason to communicate WITH children instead of TO them, FOR them, or AT them. How to accomplish respectful communication and help children develop a sense of capability and self-discipline is the focus of Positive Discipline. 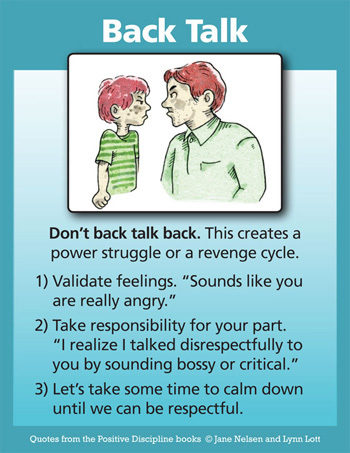 For now let's discuss “backtalk” and how to stop “back talking back.” The following suggestions are from the book Positive Discipline A-Z by Jane Nelsen, Lynn Lott, and H. Stephen Glenn. Use the “back talk” as information (it could tell you that something is amiss) and deal with it after you have both calmed down. Look for places you have been turning issues into power struggles with your child. Instead of focusing on the disrespect, focus on the feelings. Say something like, “You are obviously very upset right now. I know it upsets me when you talk that way. Let’s both take some time out to calm down. We can talk later when we feel better. I’d like to hear what you are upset about. Do not use punishment to “get control.” When you have both calmed down you can work on a respectful solution that works for both of you.. If you are not too upset, try hugging your child. Sometimes children are not ready to accept a hug at this time. Other times a hug changes the atmosphere for both of you to one of love and respect. Be willing to take a look at how you might be teaching the very thing you abhor in your child by being disrespectful to her. Have you created an atmosphere of power struggles by being too controlling or too permissive? Make sure you do not “set your child up” by making disrespectful demands. Instead of giving orders, create routines together during family meetings. Instead of saying, “Pick up your shoes,” ask, “What about your shoes?” You will be surprised how much more inviting it is to ask than to tell. Once you have both calmed down, let her know you love her and would like to work on a respectful solution to what happened. Take responsibility for your part and work on a solution together. Apologize if you have been disrespectful. “I can see that I was disrespectful when I demanded that you pick up your shoes. How can I ask you to be respectful when I’m not?” Let her know that you can’t “make” her be respectful, but that you will work on being respectful yourself. Have regular family meetings so family members learn respectful ways of communicating and focusing on solutions. Children can learn that their parents are willing to take responsibility for their part in an interaction. They can learn that back talk isn’t effective, but that they will have another chance to work on respectful communication.